Think healthy food means boring food? Think again! Stock your kitchen with these items to pack flavor and variety to your dishes without adding calories. Salt-Free Seasonings: Mrs. Dash brand offers an endless selection of seasonings that provide a ton of flavor without the added salt many other brands contain. Diets high in sodium can lead to high blood pressure and increase your risk for heart disease. Sprinkle straight on meat or fish before baking or mix with fresh Parmesan cheese as a topping for roasted vegetables. Try Tex-Mex Avocado Chicken. Vinegar: varieties such as balsamic, white wine, and apple cider give meat, fish, or vegetables a slightly sweet and acidic kick without added calories. They also make a great substitute for salad dressing or coleslaw. Try Roasted Cod with Red Wine Balsamic Tomato Jam or Pineapple Coleslaw. Citrus Juice/Zest: juice and zest of lemons, oranges, and limes are a great way to finish any dish before serving. The tang acts to brighten the flavors in your recipe without the need for butter or oil. They’re also loaded with Vitamin C for an added immunity booster! Try Citrus Roasted Broccoli and Cilantro Lime Quinoa. 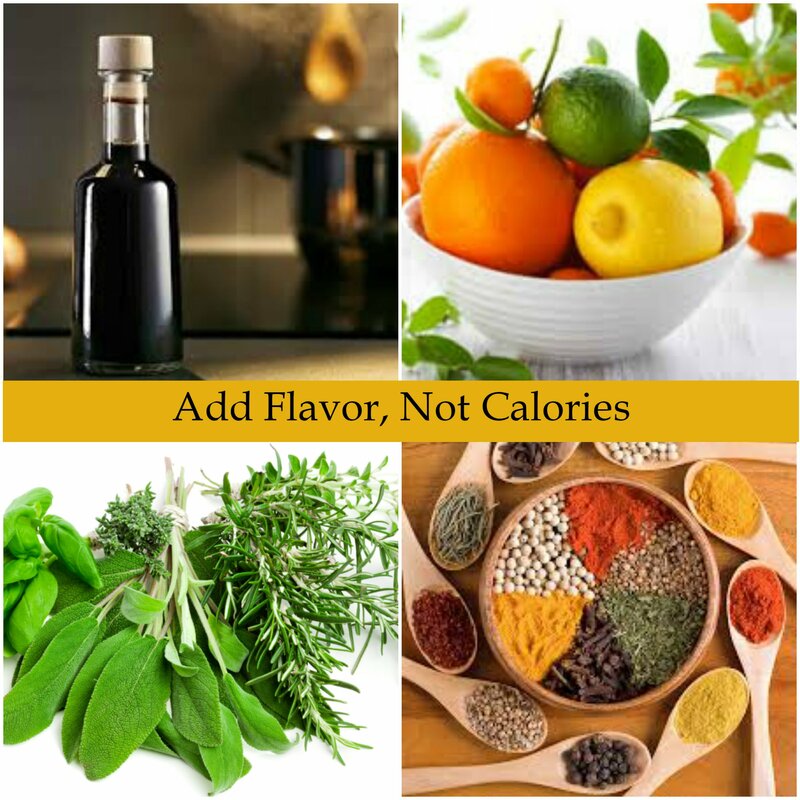 Spices: adding spices to any recipe can maximize flavor without adding fat or calories. Some even provide extra health benefits such as decreasing inflammation or boosting immunity. Common spices include cinnamon, turmeric, ginger, and cumin. Try Cinnamon Spiced Sweet Potato Carrot Fries and Honey BBQ Kale Chips. Hot Sauce: most hot sauces have less than 5 calories per serving. Although high in sodium, you only need a small amount for most dishes due to its high heat content. Capsaicin, the component that gives chili peppers heat, has also been shown to increase metabolism. Try Southwestern Egg Tostada and Slow Cooker Buffalo Chicken Chili. Fresh Herbs/Garlic: using fresh chopped herbs and fresh minced garlic to season your recipe helps cut down on added fat and sodium typically used to add flavor. Their natural oils infuse into any dish to bring impeccable flavor and fragrance without the guilt. Stock your pantry with dried varieties when you don’t have fresh options on hand. Try Spaghetti with Kale-Garlic Turkey Meatballs and Margherita Pizza Hummus. Low-Sodium Stock: chicken, vegetable, or beef stock can be used to sauté vegetables without oil or butter. Use it also as a replacement for water when cooking rice, grains, sauces, and soups. Low-sodium varieties are best to use to cut down on extra sodium consumption. Try Seafood Soup or Asian Turkey Lettuce Wraps. Words cannot describe how glad I am that hot sauce made the list.